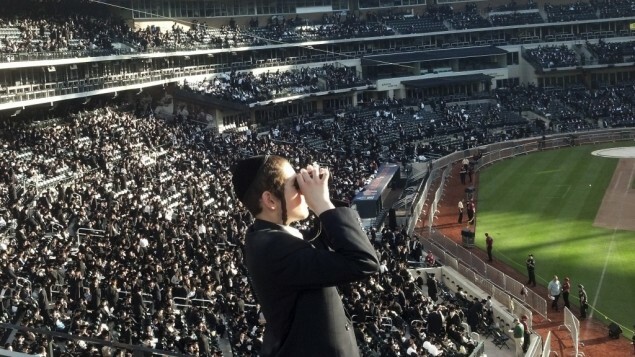 At this moment, I swung my binoculars toward the policemen and policewomen on the field and noticed that most of them had turned to face Rabbi Wachsman, this man in the long black frock sporting a long white beard. They seemed mesmerized (like everyone else). His message hit home for them too. That’s when I understood the far-reaching effects of this gathering; that the message was not only for us, but “to illuminate the world,” as Rabbi Wachsman said in his opening. Remarkably, the media coverage conveyed virtually none of the real content of the event, none of the universality of its message. It was as if the problem wasn’t a big deal, didn’t exist or that they couldn’t give credit to the observant community for coming together in such an unprecedented way in order to try to make a stand. If anything, the media seemed more bent in using the gathering as a springboard to launch their favorite barbs at the religious Jewish community. The disparity between what went on inside the stadium and the way the media reported it was incredible. In my next “Impressions” entry I hope to discuss that.